Although we like to think so, organic food doesn’t always taste better, which on its own is a shame, but the bigger deal to me is that the deficiency of taste also points to a deficiency in nutrition, which is common in organics. But like the pesticide-spraying orchardist above, I don’t eat conventional apples. I try to buy mostly organic food because I want to stay away from pesticides/GMOs and I prefer to support the small organic farmers who are trying to find a more sustainable way of farming. But what’s just as important to me is eating food that is nutritious, because poor nutrition in my food equals poor nutrition in me, which means various health issues that I’d rather not experience. That’s why I grow my own food, because it can be made tastier and more nutritious using organic methods if it’s grown in an ecosystem that is teeming with a huge diversity of beneficial microorganisms and a balanced array of nutrients. There are many strategies to accomplish this. Let’s look at one of them today: compost. Compost helps with both of these things. It adds the nutrients, but more importantly, it adds the microorganisms. Most people don’t know it, but that’s the main reason to use compost. Interestingly, compost would go a long way to help that conventional orchardist with his pest problems so he could stop the pesticide use, because it has tremendous disease-controlling capabilities when applied to the soil, and also when applied to plant leaves as compost tea. The first may sound like common sense, but it bears stating: it must be good compost. There’s a lot of bad compost out there and it causes more harm than good. It needs to be made aerobically, with reasonable materials. It must smell good and look good. It’s best to make your own. Bad compost causes disease. Good compost fights disease. The second is the really important one: Don’t use too much. Most organic gardening books say “the more compost the better.” That’s not it, though. You’re going to throw your nutrient ratios out of balance if you use too much compost. I did for years. It made the soil look and feel nice, but after a while, it didn’t produce well. How much is too much? If you look at the work of people like Elaine Ingham and the Luebke’s in Austria, they recommend a maximum of 1/8 inch of compost spread on your soil when you’re beginning, and 2-10 times less after that. We’re talking just a light dusting each year. 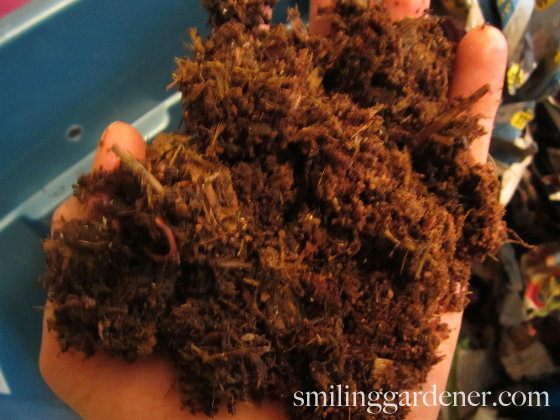 The moral here is that it’s highly worthwhile to learn how to make your own compost, even if just a small amount. Even a worm bin is really all most home gardeners need. The reason I’m talking about compost today is that I’ve been reviewing various new research studies that have implications for organic gardening, and I’ve noticed that compost is still being researched (has been for a long time) with positive results. I’m doing this review because I’m in the process of updating my online gardening course – the Smiling Gardener Academy – as I do every year.